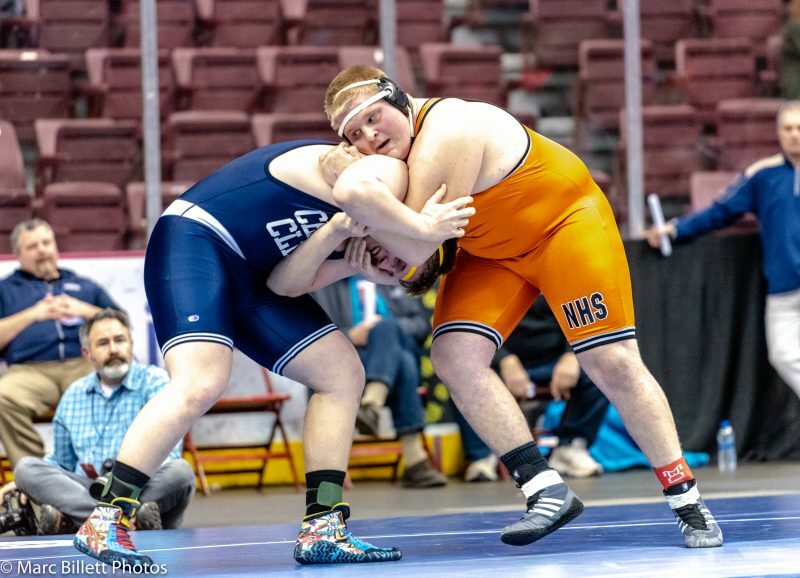 Friday night at 8 P.M. inside the GIANT Center in Hershey, PA the 2019 PIAA State Dual Team Semifinals will take place in both Class 2A and 3A. I heard a comment earlier this week that we could save everyone a lot of time and money by just skipping ahead to a #1 Reynolds vs. #2 Southern Columbia dual for the PIAA Team Wrestling Championship in 2A. While it’s not quite that bad, the top-ranked Raiders and #2 Tigers have been every bit as good as advertised through the first two rounds in Hershey. Reynolds has outscored Notre Dame-Green Pond and Westmont Hilltop 101-27 in its two duals. On Friday afternoon, against a pretty well-balanced lineup from Westmont Hilltop, the Raiders didn’t allow a single point in eight of the 14 matches, and they didn’t trail in a bout until halfway through the dual. Southern Columbia has outscored Conneaut Area and Brookville 113-27 in advancing to the semifinals. The Tigers have gotten bonus points in 17 of the 28 scheduled bouts in those two duals, including 13 that brought six points (12 pins and a forfeit). So, sure Reynolds and Southern Columbia have been head and shoulders above everyone they’ve faced so far in Hershey. But there’s a chance that they could be pushed in the semifinals. I asked Chestnut Ridge coach Greg Lazor, whose #6 Lions have looked pretty formidable themselves in crushing #23 Freedom Area and #13 Hamburg, how difficult the task will be against Southern Columbia tonight. #3 Saucon Valley has the talent to push Reynolds, but the Panthers will need to spring some upsets. How about at the lightest weight? Returning state champion Gary Steen will be favored, for sure, but freshman Chris Arciuolo, who is ranked ninth, has been excellent. If he could pull the upset, it would put Saucon Valley in a much better position. In 3A there is a similar situation occurring as #1 Bethlehem Catholic has outscored their opponents (109-20). The Golden Hawks are soaring but so are the #2 Kiski Area Cavaliers who took out #6 Cathedral Prep in the quarterfinals (39-30) after forfeiting the final four bouts of the dual. Let’s not forget that #4 Liberty and #5 Nazareth are sitting at home. Like the Reynolds and Saucon Valley meeting I think the Bethlehem Catholic vs. Council Rock South match will be a fight at most weights with some competitive bouts throughout.